I think it is prettier than the cocomats; however, if your planter is within reach of squirrels say bye bye liner. 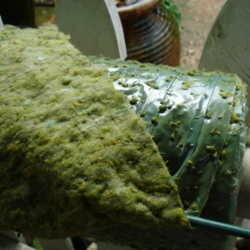 Squirrels yank the cottoney exterior of the liner and throw it all over the place when they realize it is not edible. The SupaMoss liners that the squirrels did not ravage have not been replaced in 2 years (still looking good) whereas the coco liners need replacement yearly. Even though they're durable, I won't buy them again as I move my hanging baskets around and don't know when they will be within squirrel reach. 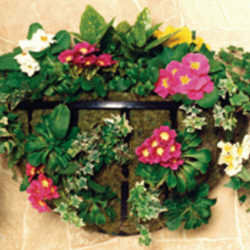 Supamoss is a manmade basket liner that doesn’t attract birds or squirrels like some mosses and coconut liners do. Supamoss helps retain moisture and lasts for two to three years.